November 14, 2015, Clearwater, FL – Overwhelming pressure wasn’t enough to keep Phil Kojack and the Towson Titans from not allowing Steve’s Sports to repeat from their 2014 title. 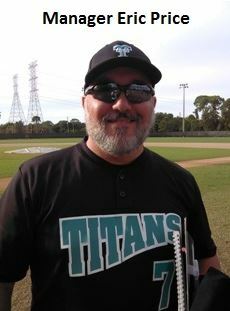 The right-handed pitcher Kojack mixed pitches well throughout while holding Steve’s Sports scoreless over the final six inning to make each of the Titans’ three first-inning runs stand in a thrilling 3-2 victory. Towson received a two-run single from Chad Reeves and Ryan Welling’s sacrifice fly to left against tough-luck starter Nick Carucci in the first. It was all they’d get for the day. But with Kojack on the mound, it proved to be enough. Steve’s Sports responded with single runs in the second and third to pull within 3-2. First, Keith McLeod got Steve’s on the board with a sacrifice fly. Then, an inning later, Jake Plata’s two-out RBI single to center plated Matt Altieri. Steve’s Sports, which was making its fourth consecutive Fall Classic title game appearance, finished round-robin play 4-1, before topping the Atlanta Dragons 12-4 behind Jeff Salay’s strong pitching performance. Winning the championship completed a 7-0 week for the Titans, after Josh Davis’ 8 innings on the mound were enough to pave the way for a 9-3 semifinal victory over the Brandon Bombers.